The weekend started off all according to plan. I left work early on Tuesday and Mike and I set out for Phoenix. We stopped in Yuma for dinner at Chipotle where I was served a burrito the size of my forearm and somehow managed to take it down in two sittings (Mike impressively finished his in one). We arrived in Scottsdale at my good friend Lana and her fiancé’s house around 9 p.m. and chatted for a bit and called it a night. Friday I slept in, did my 2 mile shake out run, and cooked a big marathon runner friendly carb breakfast and we headed to the expo. As instructed, I spent little time of my feet on Friday. 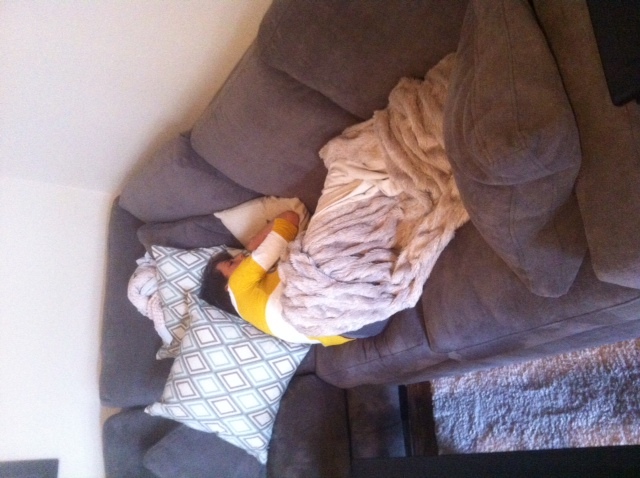 In the afternoon my body got really tired and I ended up taking a short nap on the couch. I was drained by 7:30 p.m. and couldn’t wait to get in bed (this is 6:30 PM San Diego time which means I was really tired!). We got in bed around 8 p.m. anticipating our 3:15 a.m. wake-up call but I anxiously couldn’t fall asleep until 10:30 or so. Day Before the Race Breakfast! 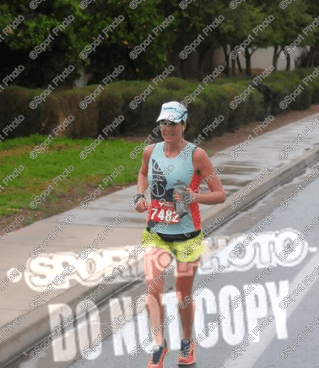 To preface this post for any new readers – this was my 4th marathon and my 2nd (or 3rd depending how you look at it) attempt at a Boston Qualifying time. My first attempt was the Eugene Marathon in April 2013 where I believe I had a panic attack or something similar around mile 4 and ended up deciding to pull out of the race by mile 8. The next weekend I tried to redeem myself at the OC Marathon but ended up finishing in about 6 minutes shy of the BQ. Despite the fact that I had failed, I was proud of myself for a 8 minute PR and for giving that race all I had. I already knew going into Eugene/OC that I wouldn’t be attempting another qualifying time in time for the 2014 Boston Marathon as I was planning my wedding and getting married in September. So after OC, I relaxed a bit and was fine with the idea of trying again in 2014. 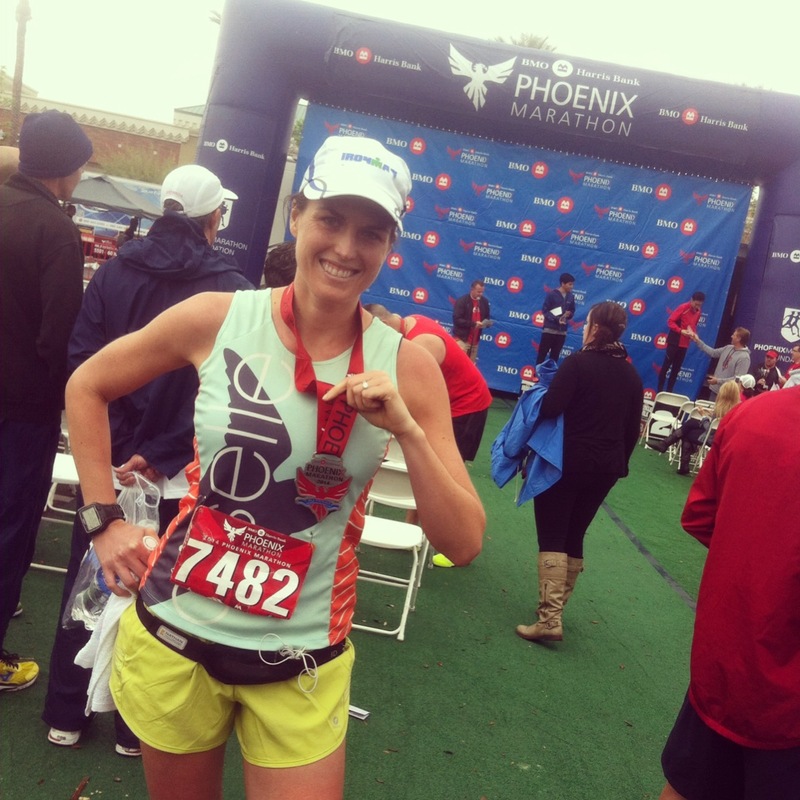 Going into the Phoenix Marathon I was more nervous than all my previous marathons, triathlons and even the Ironman. The week leading up to the race my heart would flip flop and stomach would sink when I started thinking about the race. I couldn’t fall asleep at night with possibilities going through my mind. The two days leading up to the race I was very anxious. If I was really honest with myself, (which I really tried not to be because I was trying to focus on staying positive as part of my mental toughness) I did NOT feel prepared for this marathon. Despite having a really great coach, I had a few factors that made me feel I wasn’t ready. 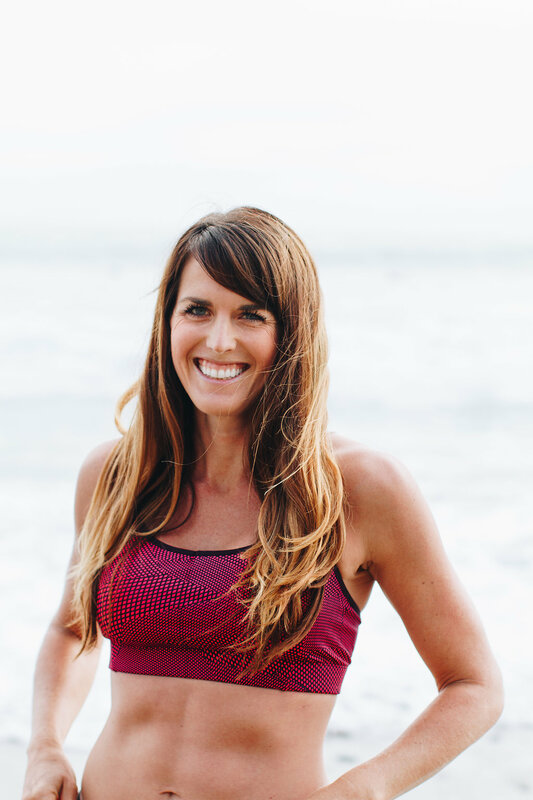 The first was the fact that I had a short marathon training cycle to start with (15 weeks) after a long period of not training a lot due to planning my wedding and going on my honeymoon last summer and fall. This period of time was the least I have trained since 2010 when I started this blog. I had planned to run the Mountains to Beach Marathon in May but after I found out we had an important wedding to attend that weekend, I had to cancel my plans and go with another race. Phoenix was much sooner but I felt that with proper training I could make the gains necessary to myself BQ ready. However, just over a week after I ran the Holiday Half Marathon (which included a taper and a recovery week before and after) and JUST AS I was heading into peak marathon training, I sprained my ankle and missed several key running workouts. Although I was able to supplement with cycling, aqua jogging and the elliptical, I missed the chance to do a lot of key speed work and long runs. I was able to build some fitness over this time and I decided to go ahead with the marathon despite the fact that it meant I’d only get in 2 runs over 16 miles before the race. Ultimately, I think my anxiety leading up to the race had to do with me lacking the reassurance I needed that I was able to run 26.2 miles at an 8:12 pace or faster. Especially in a storm. The 10 day weather forecast predicted a storm complete with a heavy headwind rolling through Phoenix and I let the weather forecast freak me out. I have been training using a heart rate method, which I definitely think works, but also has me running VERY slow at times. I didn’t get the positive reinforcement that I was a fast runner like I have in prior cycles. I thought maybe I was fast enough, but I really had no idea. The two key speed workouts I did post ankle sprain were both hill workouts so I didn’t even have a solid track workout to tell me that I was able to run faster than ever. 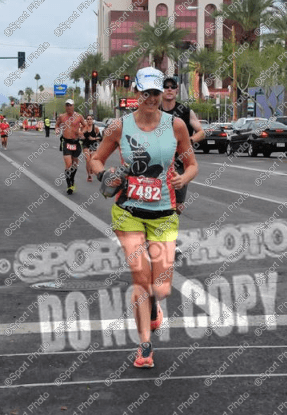 I only ran at marathon pace twice during my entire training for Phoenix. A more confident runner may have not needed the reassurance of marathon pace runs but I think I needed it. The plan my coach provided for me and that I agreed with going into the race was as follows: Miles 1-4 (400 feet decline) would be kept in low Zone 3 and NO faster than a 7:50 min/mile but ideally closer to 8 -8:10 min/mile. Miles 4.5-6.5 had a long gradual incline. I was also NOT to let my heart rate exceed Zone 3 in this section, even if it meant slowing way down and letting lots of people pass me. Miles 6.5-10 are another downhill and I was to coast down in Zone 3, not exceeded 7:50 again. Once I was into the 2nd half of the race I was allowed to let my heart rate go into high Zone 3 and not only until mile 23/24 was I to go into Zone 4 (Zone 4 is the pace you’d run a tempo run, 10k or the second half of a half marathon in and by my understanding, isn’t sustainable for 26.2 miles). Seems easy enough. My very last question to Maria at the end of our final pre-race plan discussion was “What happens if I can’t maintain my pace in Zone 3 – do I just run in Zone 4 and hold on?” She said yes but I really pushed the thought of it happening out of my mind. Back to race day. I woke up feeling good despite the ridiculously early hour. 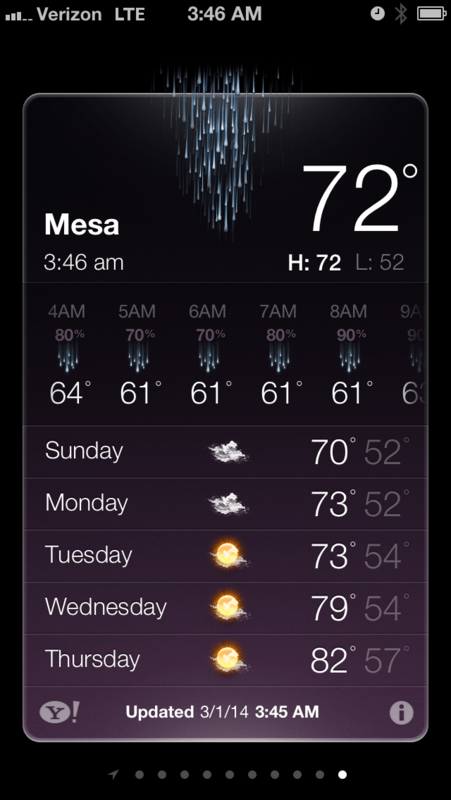 Immediately checked the weather in Mesa (where the Phoenix Marathon is actually held) and wasn’t even upset by the fact that it was in the 70s AND raining. I knew the weather wasn’t going to be ideal and I’d already moved on. I kept repeating positive affirmations to myself and to Mike. He dropped me off at the bus line for the full marathoners and I was happy that I was able to board a bus very quickly. Soon I was on my way. I made small talk with the woman sitting next to me for a bit who told me she was going to run the marathon without having done a long run more than 8 miles. At least I wasn’t that unprepared! 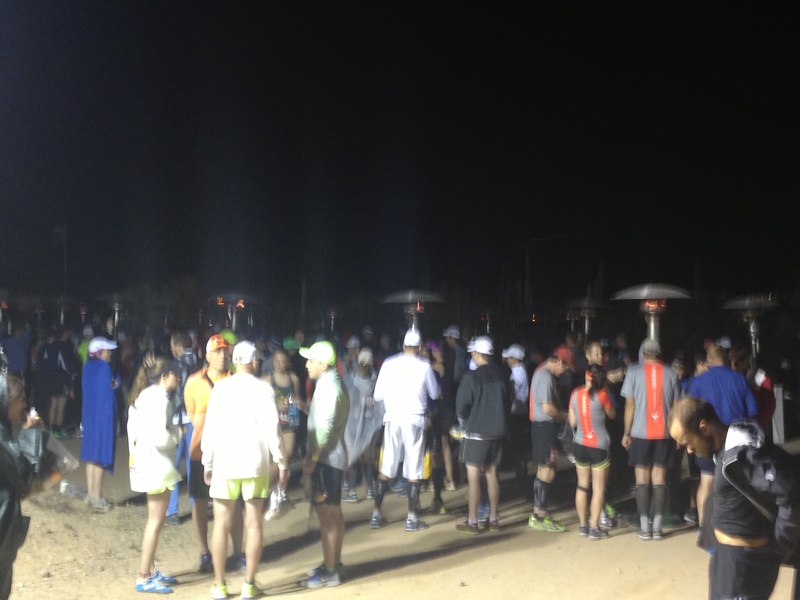 When I got to the start line, which is located at a dusty gun range, I felt good. The bathroom lines weren’t bad so I went and then found one of the many logs to sit on. The atmosphere was lively and there were lots of people hovering around outdoor heat lamps to keep warm. It wasn’t warm but it wasn’t cold. I was a little cold in my Oiselle sweats but not bad. Before I knew it, it was 10 til 6 a.m. so I got back in line for the restroom. I started a conversation with a man and a woman in front of me and stopped thinking so much about the race and just had a fun conversation with them. Just before I got my turn in the porto-potty, the fireworks went off and it was almost time to go! Soon after, it began to rain. 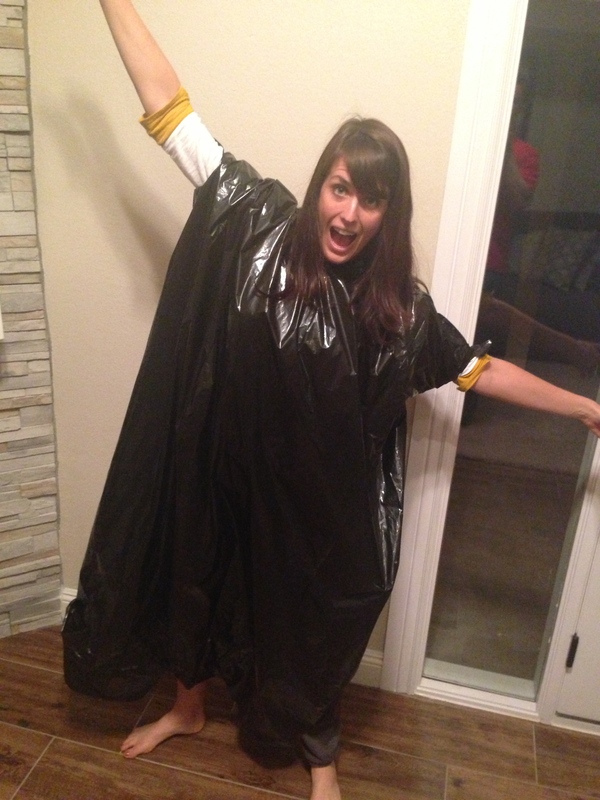 I got out my trash bag poncho and my umbrella and it wasn’t so bad. I chatted with my new friends and also took my pre-race Gu at this time. By the time I was out of the restrooms, I only had time to do a quick jog to the bag check, strip off my sweats and wrap up my phone in the plastic baggies and jog to the start line (which was a short distance down the road). I made my way to the starting area in a good mood despite the wind and rain. I was ready to go and nothing could stop me! I found the 3:35 pacer and introduced myself. I asked him the strategy and he kind of made some kind of joke and I instantly knew he wasn’t taking it seriously and also knew he’d probably go out too fast. It was still raining so I was wearing my poncho. With about 4 minutes to go til the start I took it off and threw it to the side. Then, almost immediately, it began to rain MUCH harder. People started shouting to start the race. No one wanted to shiver in cold rain before running a marathon! I went back over to the side and tried to find my trash bag which had blown away. I grabbed one and held it over my head til the gun went off and then crumbled it and held it in my hands until I found a good time to throw it to the side. It was dark still so I couldn’t see my watch. I just followed the pace group for the first mile. I felt FANTASTIC. My legs were light, my breathing easy. I felt very optimistic. The first mile sped by and it was just as I had hoped – about 7:55 pace. I knew the first mile would be fast due to the incline. It was starting to get light so I could see that my heart rate was in mid zone 3. I consciously decided to slow down and back off the pace group so I could keep my heart rate lower. I didn’t want to overexert in the beginning. The second mile was 7:59. The pace group was long gone and I was already 30 seconds ahead of goal pace. The entire first 4 miles is a slight decline. I kept waiting for a significant hill to propel me but it never came . It was so gradual it was hard to tell the decline was there but it definitely was. My pace slowed a bit as I tried to control my heart rate. Around this time, Steph, a reader of my blog who had emailed me a few months ago and I knew would also be running the race and going for a BQ, ran up to me and introduced herself. We chatted for a few minutes and I noticed our pace got a little slower. After a few minutes Steph told me to have a great race and took off. We ended up playing tag for the first few miles or so and I was really hoping we’d see each other more during the race but unfortunately that didn’t end up happening (I later found out Steph ended up getting her BQ by 15 seconds. She BQed last year but didn’t get into Boson since it was so competitive so I was VERY excited for her!). It was still raining a bit but nothing bad. I’m not sure exactly when it stopped but somewhere between miles 3-4. Around mile 3 or so a man ran by me and complimented me on my running form. He said “I could balance a cup on your head!” I laughed and thanked him and thought that my running form drills must have paid off! Having him compliment me made me focus more on my cadence and form. I was feeling great! It was my day. Screw the wind! Soon after this, there was a slight hill that I wasn’t expecting. I figured I’d make up time on the downhill but my 3rd mile split came in at 8:15 . I was a little surprised since I’d kind of banked on those first 4 miles being very easy and fast with the decline. Mile 4 clocked in at 8:07 and my average was now around 8:05. My heart rate was supposed to stay in low to mid zone 4 at this point but I couldn’t help but let it creep to high zone 3. I got a little worried because Maria had said in one our conversations that she thought my heart rate might even be in Zone 2 on these declines. I also knew that these first few miles were into the wind, which is probably why I was working harder. Although the first mile I was running in a pack and didn’t feel the wind, I was out in the open now and wasn’t able to hide from it. Mike’s photo of me around mile 4 – feeling good! As soon as I approached the long hill that began at mile 4.5 I slowed down. People started passing me. This was all part of my race plan. Don’t let my heart rate exceed Zone 3 on the hill. Maria warned that people would pass and I should let them go. It was my race, not theirs and they’d blow up later. I focused on this and tried to keep my heart rate as low as possible, but it still popped into Zone 4. I also lost more time on the hill than I had hoped, clocking 8:51 and 8:49 averages on miles 5 and 6. I was very disappointed as I watched my average creep up from below goal pace to over 8:20. My heart rate was too high and I was already behind pace and some of the easiest miles were behind me. This is when the doubt began to creep in. However, I knew at the top of the hill I was going to get a nice ride to the bottom. This section was steeper than the opening 4 miles and I was able to easily make up time. I figured as long as my heart rate didn’t go over Zone 3 I could make up some time here and I easily coasted down, passing people along the way. Miles 7 and 8 were 7:35 and 7:57. I wasn’t supposed to go under 7:50 at all in the race according to my race plan but in the moment, I let my fears of losing time on the incline push me to rush the decline. At the bottom of the hill I was working hard to keep up on the flat. I ran a 8:04 and 8:08 on miles 9 & 10 but it felt hard. I took my Gu early because I thought maybe I needed more fuel. Somewhere around here I came on a long, flat section which headed south, directly into the strong headwind. There was no one to draft off of except for one guy who was not very big. I kept trying to get behind him and draft but it wasn’t doing much good. To me, the wind felt like it was pushing me further and further away from my goal. I was battling it and losing. This is when I lost it. I was working way too hard way too early to maintain the pace. My heart rate was now in low Zone 4 and I couldn’t get it out without slowing down. I was conflicted. Do I keep pushing hard and crash hard, or slow down now? I decided to slow a bit and focus on effort and not my watch. Mile 11 and 12 clicked off 8:15 and 8:07. Mile 13 was 8:21. I had now run some tangents wrong and was behind on the mile markers. Doubts began to creep in. It felt too hard. How could I sustain this pace for 13 more miles?! The final blow was crossing the half marathon marker which also happened to be the half marathon start. I don’t remember exactly what my watch said but it was something in the low 1:48s. At OC Marathon I crossed the half marathon marker at 1:47 something and finished in 3:40. My legs were aching, I was working too hard, the headwind was blowing, a huge blister was forming on my foot, I was already behind the mile markers, and in my mind I just couldn’t believe I could make up a minute or more in the 2nd half of a marathon. I didn’t think I could negative split. I thought about the half marathoners who were starting their race fresh at this same point and I felt overwhelmed at the thought of crossing the same distance I’d just finished FASTER without the benefit of a decline (the majority of the decline in this race is in the 1st half) and probably with a headwind. That’s when I gave up. I hate saying I gave up because I focused SO much on mental toughness going into this race. I knew it was my weakness and then I let it destroy me. I stopped pushing out negative thoughts after I crossed that half marathon marker and let them in. I’m not ready for this race. My training cycle was short. I got injured. My friends and family tracking me are going to know I can’t do it when they see my half marathon split. 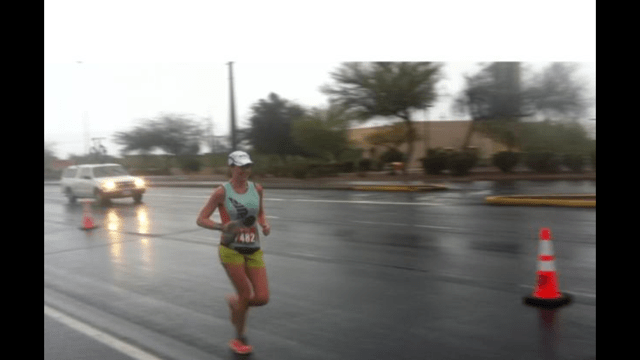 I was already cutting it close and the weather conditions made it impossible for me to BQ. I’m not a good runner. I’m not meant to be fast. I don’t know how anyone ever qualifies for Boston. I JUST WANT TO GET THIS OVER WITH!!!! And so that’s it. The second half of the race was uneventful other than the pain. I stopped looking at my watch. I ran by feel. And the more I ran, the slower I got. In my mind, I never once thought about my race plan if I didn’t qualify for Boston. It was Boston or Bust. I didn’t care about a PR. I didn’t care about Sub 3:40 or Sub 3:45 or even sub 4 hours. Mike saw me around mile 14 or 15 and tried to convince me that the 3:35 pace group wasn’t too far ahead. He said I could do it. He ran with me and gave me a pep talk. I tried to pretend I was motivated but I wasn’t. He could tell but it didn’t stop him. Temporarily I was motivated. It didn’t last long. . My stomach was sloshing with liquids and Gu and I pushed off taking more gels for a while. My legs were in so much pain. I’ve never experienced so much fatigue in my legs so early on in a race. Blame it on the net decline, blame it on lack of fitness, who knows but it was painful. The times that I did check my watch, my heart rate was nice and cozy in mid-low zone 3. All I cared about at this point was finishing with as little pain as possible. If BQ wasn’t happening, there was no point in pushing myself to the extreme. My legs hurt enough, I didn’t need to torch my lungs. Toward the end, as my pace dropped into the low 10s, my heart rate was even in Zone 2. Just like all those long runs in Zone 2. Nice and steady. Comfortable. What I was used to. When the 3:40 and 3:45 pace groups passed me, I’d get some motivation to follow, if only to block the wind but I could care less after a minute or so and fall back. My only real goal for the race was to finish and NOT walk. I knew if I walked, it’d be hard to get going again. The miles ticked by and my only motivation for going faster was to relieve the pain faster. I told myself at mile 24 I’d pick it up to tempo pace (zone 4). I couldn’t muster any motivation to do it though. By mile 25, I garnered some motivation and picked it up. It was fun to pass people and my legs actually felt better at the new pace. I finished this mile in 8:52 and the final 0.40 miles at 7:56 as I crossed the finish line. I was pleasantly surprised when I looked up my time the next day that I broke 3:50 and finished in 3:49:57. Ironically it was a big goal of mine in 2012 to break 3:50 and I was SO happy when I did. 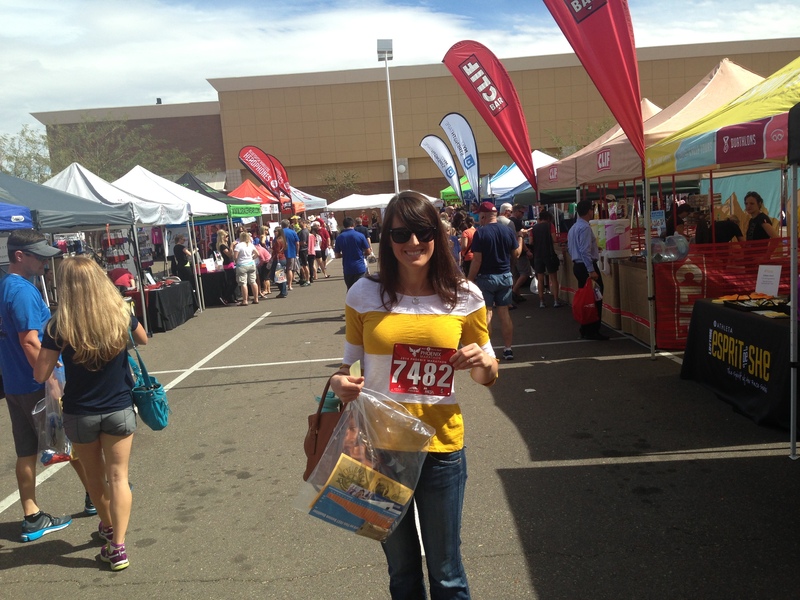 It’s funny how things change – after finishing under 3:50 at Phoenix I found a chair and cried into my hands. I tried to compose myself but as soon as I saw Mike I broke down and sobbed on his shoulder. This was my most defeating marathon. I have a lot more to say about how I feel about my performance, my reaction and what my plan is going forward, but that’s for another post and another day. There are lessons to be learned from every race. 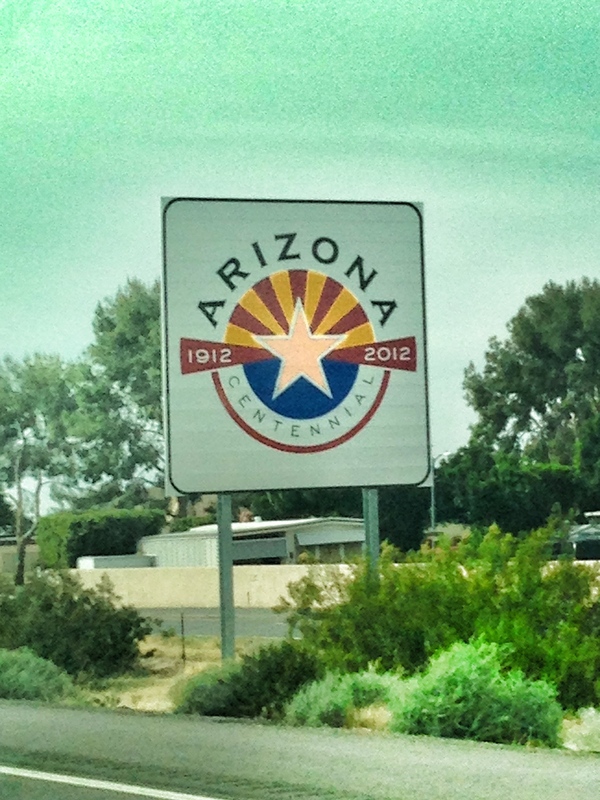 Even if it’s a hard pill to swallow, I learned more lessons in Phoenix. And I finished my 4th marathon and no matter what, a marathon finish is something to be proud of. Thank you to everyone who virtually cheered me on for this race. It meant so much to have so many supporters and I am so thankful for my friends, family, Oiselle team and virtual running buddies! I know you are heartbroken over this, but I’m quite certain from all the posts I’ve read, the measurement of who you are as a person is not solely based on whether you qualify for Boston or not. You have so much to hold your head up high for. I mean, one marathon is tough, but you have four under your belt (and they are all enviable times for a runner like me). And let’s not forget countless half marathons, a triathlon, a family that loves you and friends who are honored to be a part of your life. Thank you Luisa! I know there is definitely much more than the BQ. This race won’t define me. The paradox is that if it was easy you wouldn’t want it so badly. I think you perhaps you sabotaged yourself a bit with too much HR zone information to concentrate on. I know EXACTLY the feeling of giving up as I have been there. It’s difficult to actually explain it to someone who hasn’t experienced it. You convince yourself that you’ll be mentally strong then bang…It all goes out the door. Closest analogy I can come up with is the alcoholic who swears he won’t drunk another drop then gives in when the going gets tough. I haven’t figured out how you fix that one yet. I’ve thought about the HR thing too. I just was telling my friend she should run garmin free and just see what happens. Sometimes the data convinces me I feel a certain way but maybe I don’t?! And who knows how accurate the data is anyway?! Easier said than done. If my garmin isn’t charged, i’ll postpone my run while it charges. Having said that I’ve weaned myself off looking at in when I’m in easy/recovery mode. I need to record the data but at least I don’t let it guide my pace. Haha yes I know im addicted too!! Well, (1) that photo of you eating breakfast is the cutest ever. (2) The shittiest runs I’ve had became the one’s that I learned the most from, and made me a stronger runner. I know that probably won’t console you much but I know that you know that you WILL qualify for boston soon! Thank you! Yes there are lessons to be learned from every race- I try to tell myself that! Just gotta keep on going. Thank you for your thoughtful and honest race recap. I really do think yours is the best running blog I have read. Qualifying for Boston is a long time goal of mine, and I have convinced myself that I won’t run another marathon until I “know” I can get a qualifying time. I admire your tenacity and the work you put in-you are inspiration for me to get out there and give it a try. You’ll do it….you are young and have many years of running (and life and seeing places like Cinque Terre) ahead of you! Thank you Barbara! That means a lot!! I’m glad that I provide inspiration for you and your support makes me want to go out and try again! This sounds EXACTLY like my Eugene marathon race last tear, down to the crying at the finish line head in hands. Exactly! I know exactly what you went through and felt. Im sorry you had to pain through it- it’s an awful defeating pain!! Ughe! But you do have a fast marathon in u. I took some time off, after Eugene, but eventually that fire came back and I ran CIM that same year and missed a BQ by 30 seconds. We have it in us!! Dont give up!! I wish u could run M2B with me!! U will get your BQ! I will too! Congrats on a sub 3:50 finish even in such crappy conditions! That’s amazing! Thanks friend! I miss our marathon training and racing days! I am another advocate for ditching the garmin. Though I can’t say I’ve run anywhere near as fast a marathon as you, I recently lost my Garmin and have run way faster than I normally would in my last 2 races! Just a thought. Having said that, I do plan on wearing a pace band in my upcoming half marathon, just so I don’t have to do math in my head the whole race. Thank you! I definitely am considering losing the garmin! Ah, Nicole. I’m sorry to read this. I can almost feel your hearbreak during those long middle miles. I have no doubt you will BQ. I admire how you make a goal and go after it with such determination and dedication! It sounds like by racing by heart rate people end up so much in their head instead of going by feel and instinct. Congratulations on another marathon! They are beasts! Enjoy recovery time, a spring and summer without serious training maybe, and you’ll get your BQ. Thank you friend! I think now that I have more race experience behind me I can start to be more comfortable running by feel instead of data. Thanks again for all your support! Thanks for sharing your race experience. It sounds grueling and disappointing, not to mention uncomfortable running in the rain. You are to be commended for so many reasons — for setting high standards for yourself, training hard and smart, and taking on, once again, the unpredictable challenge of a marathon, to list only a few. I know you’ll get your BQ; your shorter distance times and your fitness and endurance make me confident saying so. My heart goes out to you for enduring such a crappy race. But that’s the test of a runner: can you keep going in spite of it all? Honestly, I think relentless rain (not the misty, pleasant kind) is one of the most difficult running conditions. No wonder you got a blister and felt your mental toughness slipping away. Congratulations on finishing — and on starting. I have immense respect for you. Best wishes going forward (one foot in front of the other)! My heart breaks for you because I know EXACTLY how you feel. I felt like I was reliving Eugene all over again when I read this. By mile 8-9 it was hard and by 13 it was OVER and then all I wanted was just to put one foot in front of the other and not walk. You are a strong runner and more importantly a strong athlete and you WILL have your race. You WILL. When you are ready to put your heart out there again and the time is right, you will get a BQ (and then some) and all of the attempts that led up to it will make it that much more magical. I am so sorry that Phoenix wasn’t what you hoped it be. You worked hard and you trained for a different race than what your body gave you. It is completely inexplicable how our body just doesn’t show up for us on some days. I am sure you and your coach have gone through the results and talked about everything that happened, but it seems like all of the thought that goes into paces/heart rate/mile markers during the race consumes ALOT of energy. Sometimes it is just nice to let all of that go and just RUN. The last 2 marathons (both of my BQ races) I have ditched the garmin (or switched the screen off) and only gotten splits at the mile markers. It is amazing how much this has helped me (and my garmin stalking tendencies) to run by feel and trust my body. I know this isn’t for everyone, but just a thought. Also, CONGRATS on finishing is a SUPER solid time! Thank you! I do remember your race experience from Eugene and knowing u have gone on to BQ twice definitely is motivation for me not to give up! I am highly considering ditching garmin for races! I think I’m going to try it for my next half and see how it goes! I over analyze and stop listening to my body. I have enough to think about without obsessing about a million stats. I’m sorry it didn’t happen. Do not give up! If running a marathon, not to mention BQing, were easy everyone would do it! You tried and that is more than most can say. Be proud of yourself, you deserve it! Gosh, girl. My heart ached when I read this. If you have already pushed through the mourning period and onto a new goal race, I’d absolutely love to race Ventura (Sept.) with you if you are still side-eying Boston 2015. If you’re still in the mourning period, remember that your spirit cannot be broken. It’s all about the run love. Emily! I love this idea. I actually did consider that race but I have a wedding that weekend in the Bay Area 🙁 pretty much every feasible marathon within this qualification period has conflicts so it may be a sign to wait for a good fall or winter race instead. Ill keep you posted though and thanks for the virtual cheer leading!! Ill look into that one! What about CIM in December?! 🙂 PS are you going to bird camp? CIM might be fun! No, no bird camp for me. Not in the budget and my husband’s job doesn’t have normal hours. I would seriously give up Yogurtland for a year to go. Maybe even two years. Ahh Yeah I was on the fence because of money of sure but decided to go. We will miss you. 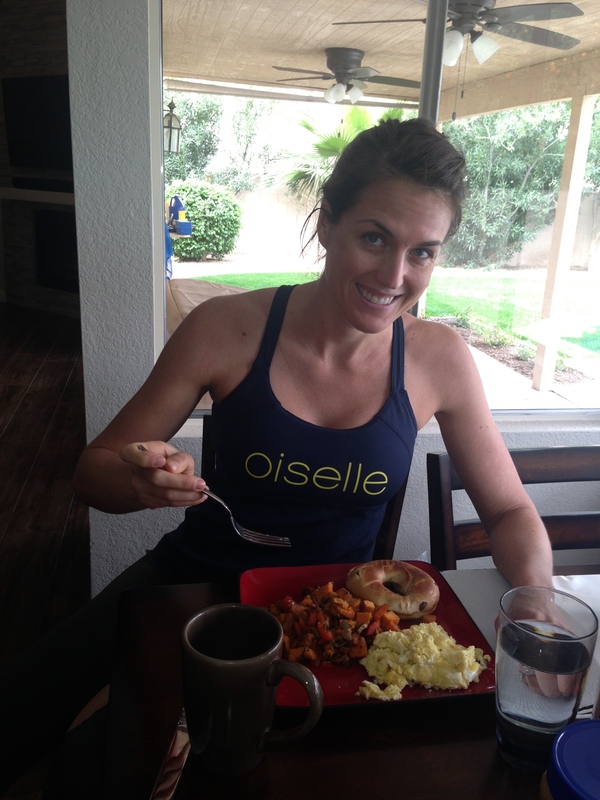 We should plan a So Cal Oiselle race meet up! Nicole, Way to stick it out when things weren’t going your way. The conditions were less than ideal and even after realizing you weren’t going to BQ you kept going and still ended up with a respectable time. You will get it next time. I agree with the others about not being so dependent on the Garmin. My heart monitor stopped working last week and until my replacement ships I have been going heart monitor-less and haven’t missed it at all. It’s turning out to be a much needed break from data overload. I know how hard you train and push yourself and I know how much you wanted this, and I’m sorry it didn’t happen for you. Still, you ran a great a marathon and I’m ever so proud of you. I really struggle with mental toughness and actually have no idea how to even work on it. A couple weeks ago, I left the house without my garmin and at first was upset about it, but didn’t want to trudge all the way back up the drive to get it. I ran without it and I felt incredibly liberated and the run felt good. But – I have no data! Was it as good as it felt? Still, I thought maybe I should run once or twice a week without it, run by feel and just run for the joy of running. I haven’t pulled the plug yet. Even that takes courage! Thank you Denice! You know I’m just like my dad and focus too much on the data! I’m going to start doing some garmin free runs and even races! Thank you Jesica! I agree wholeheartedly with the advice you have and always appreciate receiving it. I need to get back to the reason I run marathons- for the love of running! I love pushing myself and competition as well of course but all that doesn’t matter if its not fun. Not all races will be perfect and that is perfectly fine as long as I’m having fun. Thanks for the support!! My dear friend, Nicole. My heart hurts for you when I read this, but as you know, this is just a bump in the road. Something to learn from and continue charging forward. We’ve all been there and know that we all support you and you STILL RAN A FULL MARATHON! Congrats, my friend. Im totally not discounting the amazing marathon performance, but- youre an ironman and was so successful at P90X they put you in the infomercial… In my head youre like my fitness idol regardless of when Boston happens. 🙂 Cant wait to follow you on your next adventures. Congrats on #4. Aww thank you that means so much! Hey Nicole. Sorry to see that you fell just short of your BQ goal. I am sure one of the biggest factors was the missed training when you sprained your ankle! There were some other factors but I think that was one of the key ones. You do have it in you to qualify though so keep looking forward. One of the comments you made was very true. You need to get back to where running is fun and to where you enjoy pushing yourself, that is the bottom line and what it is all about. I 100% know where you were at the end of this one b/c as I mentioned on twitter I ran those same conditions in Jacksonville. I also ran in the Africa hot Miami Marathon of 2012 where I was trying to BQ. Both were giant turds. However, you showed that mental toughness you talked about by not walking and by keeping a smile on your face. You got another marathon under you belt and that BQ will be there soon enough! P.S. I’m reading your posts backwards so please know you’ll be getting a thousand comments from me in a row. Lol! Thank you! I have come to the realization that there are so many factors that go into hitting a goal pace that its probably better to just focus on effort and rating a marathon success by putting in a solid effort, not based on time. So much can happen in 26.2 miles and I can’t judge my fitness or worth or anything else based on a finish time! I’m so sorry your race didn’t go as planned Nicole. I’m heading to read your most recent post about your thoughts and plans as of now, but I wanted to read this first. It’s tough when your mind starts to go, because that’s the hardest thing to control. I know you’ve got this BQ. You’ll get it soon. I hate when you remember how wonderful you felt hitting a certain time the first time but then how it feels now. I’ve definitely had that happen a few times. Thank you! I know it’s in there somewhere too 🙂 Just gotta have all the pieces fall in place and it’ll happen! I know your story is so crazy and so awesome! Did you end up getting an official time? I wish we could have met too- maybe another race!